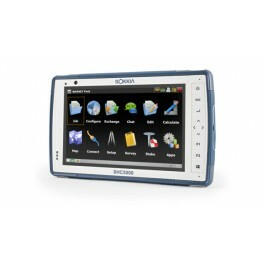 The Sokkia SHC5000 field computer is ideal for the land surveying and mapping professional operating MAGNET Field, Field Site, and Field Layout software platforms. The compact and rugged hand-held device offers a crisp display even in bright sunlight conditions. An optional 4G LTE cellular modem enables direct communication with office staff and managers through the secure MAGNET Enterprise web service – instant file transfer from active project sites.